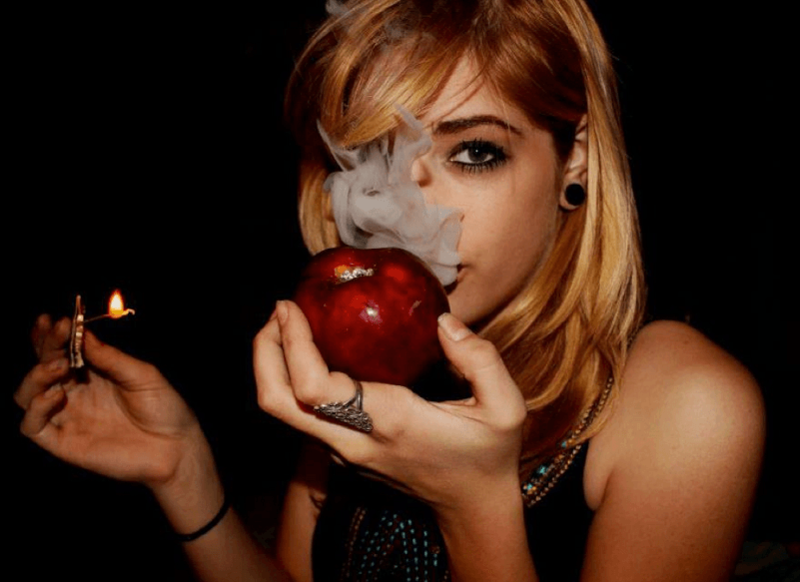 One of the most popular ways to smoke weed is with an apple pipe. Not only is this probably the most affordable way to get high, you can even eat you pipe once you are done smoking and you get the munchies. The apple pipe is basically good for one smoking session, but costing less than a buck a piece means you can keep a fresh stash of pipes in the kitchen in plain sight without even having to worry about getting busted. 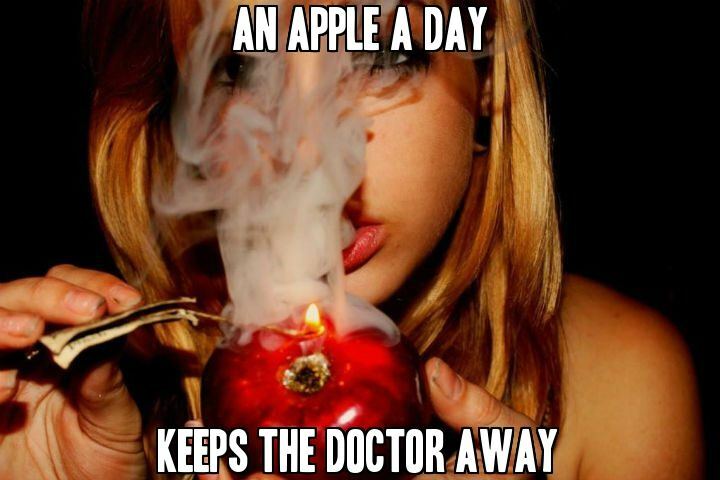 Let’s talk about all the benefits of the apple pipe, what you’ll need in order to make one of your own, and how you can enjoy getting ripped with a piece of produce. The biggest benefit of the apple pipe is that after you are done smoking, the evidence disappears like the smoke. By using regular apples, you can buy your apples when you need them from the local grocery store, and never have to worry about breaking your bong or not having a pipe when your friends want to get high. The apple pipe is also a breeze to make, with minimal supplies and a little effort you could be sparking up the pipe and taking rips in minutes from now. The other benefit is that after you make one apple pipe, you will get faster and more proficient at this skill, being able to produce a pipe whenever needed. Amaze your friends, save your money, and get high in the blink of eye. The only reason that you are going to have to head to the store for is the apples, you do need a few other things you can find around the house to help make the apple pipe. Here is your step-by-step guide for making apple pipes in under 90 seconds flat. Before you get started, all you need is your apple, some toothpicks, a disposable pen, your stash, and a lighter. As you get more skilled at making the apple pipe, you can start getting more creative with the holes and even smoke right from the outside of the apple too. 1.Start by removing the stem of the apple. Now you have a ready-made bowl that doesn’t even require the use of foil, The indent in apple top will cradle your stash perfectly for smoking. 2.Take a toothpick and push straight down the center of the hole left behind after pulling out the stem. Once you have made a deep enough hole, start making holes in a circular shape just around the perimeter of the stem hole. Ideally, you should make six holes around the center hole, be sure to push the toothpick as far down as possible before moving on to the next hole. 3.The next step we need to use a disposable pen, the type you can can disassemble and take apart so only the hollow stem remains. Remove the tip, the ink cartridge, leaving behind just a hollow plastic tube. This is going to be the smoking pipe where the sweet nectar of the weed is drawn up. 4.Push the hollow pen shaft on a slight angle down towards the center of the apple. What you are trying to do here is to intersect the pen shaft with the holes that you made in the center of the stem hole with your toothpick. 5.Remove the pen shaft and blow out the core trapped inside. once you have a clear passage to the center of your apple, then insert the empty pen back into the hole to act like your hitter. 6.Pack the apple top with your weed, then light your weed. Take a hit from the pipe, or you can remove that pipe and take a hit directly from the side of your apple. Be careful if you remove the pipe that your face is not too close to that fire. 7.Continue packing the pipe until you are stoned, then take a few bites of your apple to quench your hunger or simply toss it in the trash. There you have it, everything you’ll need to create your own apple pipe and get ripped without having to spend more than a dollar on supplies. Chillum Pipe – Is It a Regular Pipe or an Ancient Smoking Device?